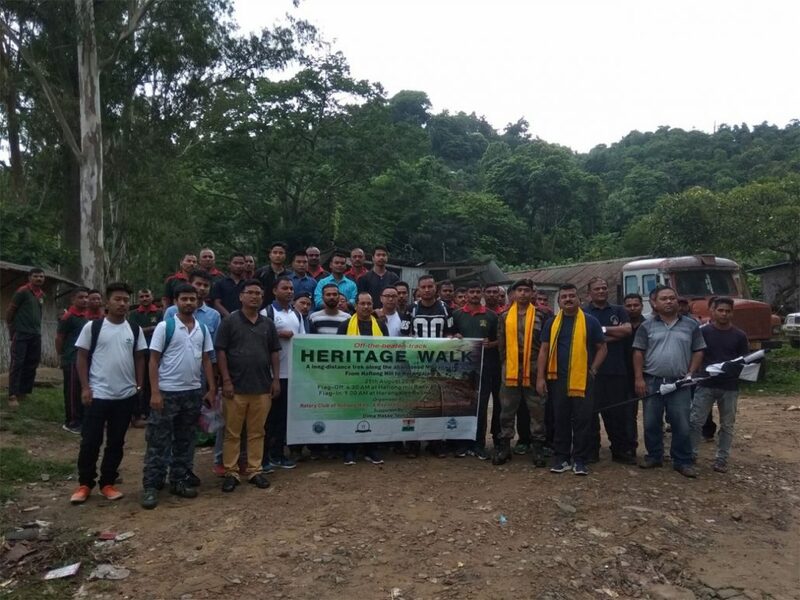 The first ever historic heritage walk (from Haflong Hill Railway Station to Harangajao Railway Station) was jointly organised at Dima Hasao district in Assam by the Rotary Club of Haflong Hills, A Ray of Hope Society (AROH) and 43 Assam Rifles and was supported by the Dima Hasao Tourism Department. The objective behind organising the historic heritage walk (along the abandoned old MG Railway track) is to promote the historic meter gauge railway track, our heritage. A report published in bijitdutta.com states that meter gauge railway track that was built by the British way back in the last decade of the 19th century through the most difficult Barail mountains in Assam’s Dima Hasao district, and was always referred to as an “engineering marvel”, has become history. The zig-zag metre-gauge tracks tunnels and bridges were a major attraction. This was one of the most adventurous, scenic, and most beautiful and the most risky meter gauge railway track of the Indian Railways. The report further states that the British had taken about 16 years to build the track. The Badarpur-Lumding section was a part of the Assam Bengal Railways and was meant to transport tea, coal and timber. People from different parts of Dima Hasao had participated in the long distance trekking event along the abandoned MG railway tracks starting from Haflong Hill Railway Station to Harangajao Railway Station. It was a tough yet exciting venture amidst hills, ravines and rivulets comprising almost 18 kms. Forty-one “full-of-beans” trekkers hit the trail at around 5:30 am on August 25 last among whom were two lady trekkers. The trekkers were totally taken in by the verdant surroundings and the “blessed beauty” of the region. They were totally in a trance and were clicking pictures merrily of the scenic beauty all around. The pure and cold water flowing down the rocks had a “soothing effect” on the trekking team. The team crossed 14 numbers of tunnels and an equal number of bridges built on the brooks. At many places, the tracks lay dismantled and even the bridges have rusted out. It was risky for the group, but any kind of ‘risk ingredient’ in trekking adventure makes it a whole lot more exciting. The entire team was received by the local people at Harangazao Station, the last destination of the trek team. Lunch was served and Assam Rifles also gave them the opportunity to say “cheers”. The team’s return journey from Harangazao to Haflong was by bus.